I was at a TUC seminar on social media last night, doing a short talk alongside a couple of very good bloggers. I’ll post notes on what I said later, but – as a prelude, I thought I’d put up a short post about something that preoccupied me for a number of years while working in web-development. Between 2000 and 2007, I had a hand in helping most of the UK’s major trades unions develop their websites and web-strategies. During that time, I always argued that the website should – at least in part – be geared towards getting the members to visit it regularly and provide information about their status and their preferences. Done properly, the members wouldn’t mind doing it (there’d be a benefit in for them – personalised content) and the union would be able to capture that data and feed it into their membership database in a two-way transaction. There was a very straightforward way of illustrating this: Whenever I was discussing this with the unions, I would sketch something like this on the back of an envelope. 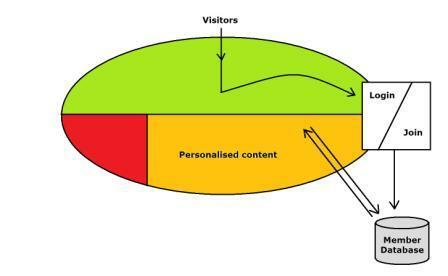 How a personalised website could work with a member database. The visitor (member / non-member) comes in at the top of the picture – arriving at the website, seeing attractive content that is in the member-only area, and logging into the site (if they are a member) or joining (if they aren’t). Once they join online (using a direct debt system that I’ve left of of the sketch to keep it reasonably tidy), the go around the private personalised area indicating preferences and visiting pages that capture information about their interests. This information is fed into the membership database that then, in turn, drives more personalisation. The red bit on the right is secure information for officers or staff – using the site as an extranet. It’s very simplified , I know. It’s not that cheap and it’s quite hard work to develop that content and think through the personalisation, and I know that organisations that have tried it have found a great many icebergs on the way. But I just thought I’d leave this image here – using it in a talk last night reminded me just how often I’d used this sketch, and I suspect that – somewhere in the world – people who are developing member-organisation websites are sketching broadly the same picture, making the same case to their colleagues…. A big job it may be, but I think it’s worth doing. Being able to sift through membership systems and find members with particular preferences is an incredibly valuable thing for the purposes of campaigning and representation.